The FIT Bodywrap® system takes the meaning of body wrapping to a whole new level. FIT Bodywrap® produces far infrared heat, which is light we can’t see, but can feel as heat. Infrared heat warms us without warming the air around us and penetrates our bodies, rather than only heating the skin. Sweat produced during infrared sessions can contain as much as 20% fats and toxins. This in in comparison to 3-5% lost during a traditional sauna or workout! Weight loss, detoxification, cellulite reduction, pain relief, skin rejuvenation, intense relaxation and much more. One of the most popular benefits of infrared heat therapy is weight loss. Infrared can re-balance metabolism directly speeding up the rate calories are burned even after one session. Fat becomes water-soluble around 100.5 degrees F and can “melt” by breaking up into smaller particles, which can then be purged from the body through infrared induced sweating. The FIT Bodywrap’s penetrating infrared heat can result in immediate therapeutic benefit through increased blood flow and tissue oxygenation. A FIT Bodywrap session can increase blood flow from 5-7 quarts/minute to as much as 13 quarts/minute. Therefore during a session there can be a substantial amount of nutrient and oxygen rich blood flowing which can help heal the body and relieve pain. Muscle aches and soreness after workouts, caused by elevated lactic acid levels, can set you back or delay progress. Infrared treatments can speed up muscle recovery by lowering lactic acid levels. Pain from injuries or chronic conditions can make it difficult to begin a workout routine. As a passive cardiovascular exercise, a FIT Bodywrap session after a workout can help increase endurance. Stretching after your FIT Bodywrap session can improve flexibility. FIT Bodywrap is the perfect way to continue making progress between workouts. Rest, relax, and recover while burning plenty of calories. The process of sweating can help the body release pollutants, but infrared sweat is different. It can contain toxins that are a bit harder to release, like alcohol, nicotine, sulfuric acid, ammonia and heavy metals. 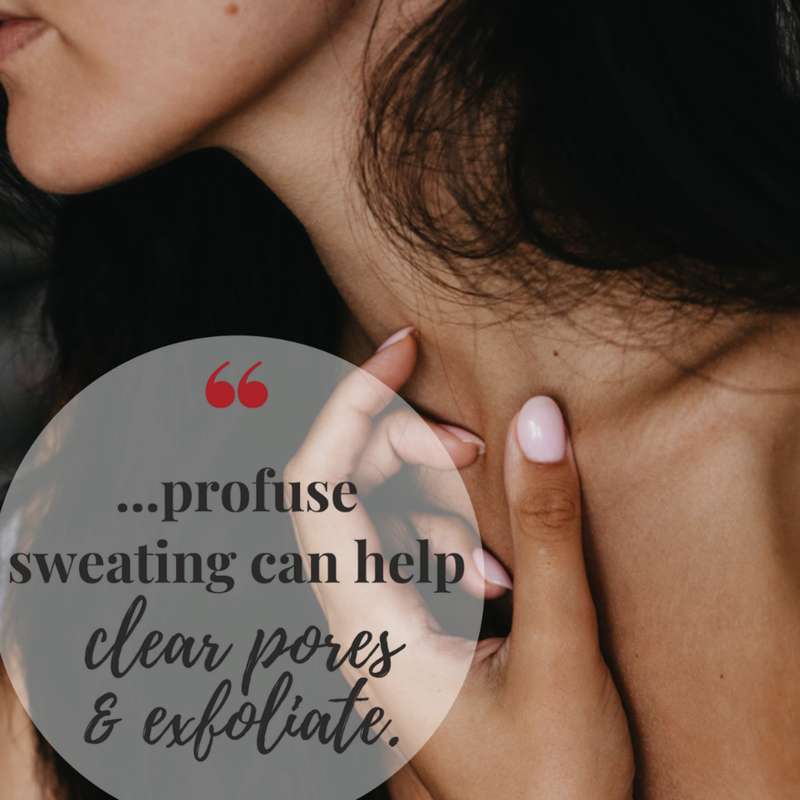 Expelling the usually hard-to-remove heavy metals and organic acids from stress overloads in sweat can help re-balance both digestion and metabolism that can adversely impact skin beauty. Infrared therapy can improve circulation, carrying oxygen throughout your body and to your skin. Increased tissue oxygenation from infrared treatments improves the appearance of fine lines and wrinkles, uneven skin pigmentation, and boosts collagen production to improve skin elasticity. Infrared treatments can provide resistance to UV damage and reverse the signs of photoaging. GET READY TO SWEAT!!! We provide you with a disposable Fit Body Coat to wear during your session. You will be alone during your sweat session, so feel free to bring a book or magazine to read. Don't forget your ear buds or head phones if you'll be watching videos on your phone or tablet. Also, we kindly ask that you refrain from talking on your phone, so as not to disturb guests in other rooms. To ensure you get your desired date and time, please book in advance. Keep in mind evenings & weekends book quickly and may have a 4-6 week wait. Is FIT Bodywrap safe to use with implants? What about other conditions? There is no research indicating that the infrared heat and temperatures generated by the FIT Bodywrap would cause changes in implants, although saline implants may be warmed by the heat. However, the FIT Bodywrap has a special control allowing you to deactivate the breast area of the wrap if you prefer. We strongly recommend that you check with your physician before starting FIT Bodywrap sessions. FIT Bodywrap may be contraindicated if you have any chronic conditions, diseases, pins, rods or artificial joints, or if you are pregnant. How many calories can be burned in a session? Your body type and metabolism. How conditioned you are to sweat. Your body’s current hydration status. Adequate application of the Fit Booster spray. Also remember that a FIT Bodywrap session can elevate your metabolism for many hours after the session ends, so the increased caloric consumption can continue for many hours as well. How does someone get the most out of their FIT Bodywrap session? It is recommended the you drink water before during and after their session to help the body flush itself of fats and toxins. Additionally, ensuring use of the FIT Booster Spray will allow for more significant session results. *FIT Bodywrap® is not recommended for clients that are pregnant, breastfeeding, have a history of cancer, or have diabetes. Treatment times are reserved especially for you! We kindly request that cancellations or changes to appointments be made at least 24 hours in advance for single services and 72 hours in advance for multiple treatments. Cancellations less than 24 hours may be charged 50% of the service total. Thank you for respecting our time, and others who wish to have the appointment time. Missed/No Show - We understand that sometimes in life we can forget. We simply ask that if you miss your appointment, please call to reschedule. However, you will be charged the full amount of your service total if we do not hear from you by end of business that day.